Another day another Benz, but at least this Nice Price or Crack Pipe 250TD is the real deal. It possesses a diesel mill, a five-speed stick, and a long roof, but will that kit make its price seem like a real steal? 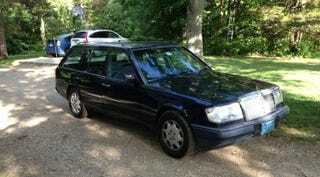 I was pretty surprised by the overwhelming 87% Crack Pipe loss for yesterday’s Heritage Motors Mercedes 500K replica. I mean, it may not have been your cup of kaffee, but it didn’t seem unreasonable considering what other examples are asking. Maybe, like China, all the sellers need some sort of currency reset? That swoopy convertible was a fake Mercedes, and obviously a style that’s of limited appreciation in this day and age. Today let’s look at a real Mercedes Benz - one that’s kitted in a fashion that a whole lot of us will likely find appealing. That of course means that Mercedes never officially sold it here in the States. Silly us for always wanting things that businesses don’t want to give us. Sometimes they do get the message, Apple for example, finally gave in and gave us iPhones with bigger screens. Microsoft likewise did the corporate forehead slap and put back the Start menu in Window 10. And Mercedes…? Well, I still don’t think you can get a diesel-powered E-class estate with a stick here, so I guess we still have work to do on that one. Never mind however, because we have this 1986 250TD to consider. 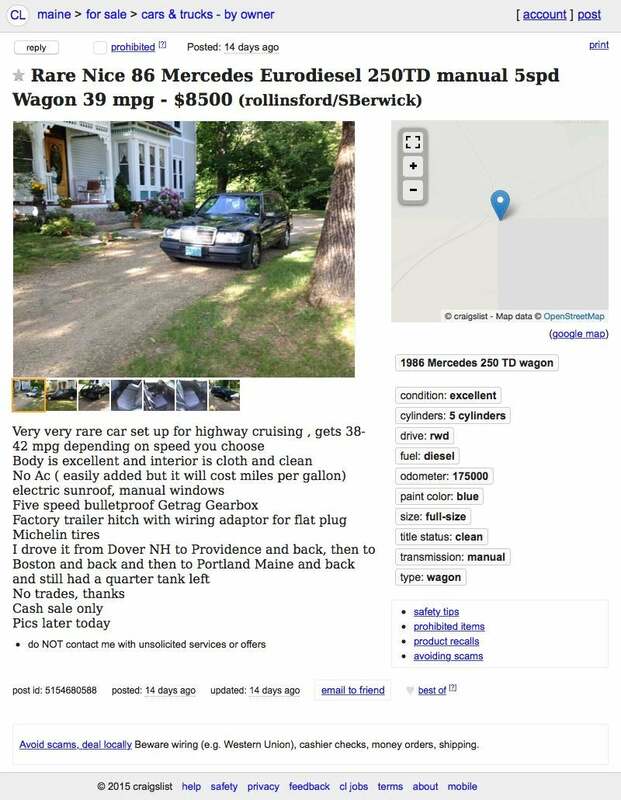 The details of its arrival in the U.S. are not included in the ad, but seeing as it’s more than 25 years old and looks like a bunch of other wagons here legally, keeping it shouldn’t be a problem. The car is super Euro, a fact not just expressed through its non-U.S. mechanicals. You also get cloth upholstery in stripey blue and a wide front license plate mount. These are things that any German taxi driver will recognize and summarily ignore but their uniqueness here is noteworthy. I wasn’t kidding about those German cabbies, as this car is set up as kind of a cheap-seats Benz, one that might take you from FBB to the Hotel Alexanderplatz without fuss. The mill is an OM602, a 2,497-cc normally aspirated SOHC five-cylinder that pumps out 90 horsepower. That might not seem like a lot, but keep in mind that these engines have a reputation for pumping out those 90-horses for, well, forever. Behind that is this car’s crown jewel, a Getrag five-speed, which should help make those 90 ponies be all that they can be. The car sports 175,000 miles and the seller says it can break 40 miles to the gallon. Part of that prowess is owed to the lack of ancillary stress put on the engine. There’s no A/C, nor electric windows taxing the alternator. It does have a sunroof, a single factory nod to extravagance. There’s also alloys off a 300E and a trailer hitch. In fact it seems like ALL of these 250TDs came with a trailer hitch. The ad says that the exterior is excellent and the interior clean. There’s no mention of whether it has the desirable third row in that clean interior, however. The seller does note a successful New England tour which seemingly couldn’t fully tax the tank. That’s a nice bonus if MPG is a sexier stat for you than MPH. Another important stat is the asking price, and that is $8,500. As you no doubt know, prices on the earlier W123 wagons have skyrocketed of late, and it’s not unexpected that W124s - especially unique-in-market examples like this one - will follow. What’s your take on this basic Benz with most all the right parts in place? Is $8,500 a fair deal to do the diesel and row your own in a Euro longroof? Or, is that too much to Eurothrash?